Maggie can't wait for her first ever skiing holiday. New Year's Eve in the French Alps with her boyfriend Leo and two other couples: what could be more romantic? She's picturing hot chocolate, romantic snowball fights and evenings snuggled together in front of the log fire. What she didn't picture is near-death experiences on the mountains, falling out with Leo and sharing a chalet with the unbearable Jenny. When she meets Sylvain, a gorgeous ski instructor, the line between harmless flirting and full-on misbehaviour becomes ... well, blurry. Will Maggie stay on the nursery slopes, or go seriously off-piste? Nicola Doherty is back with the third instalment in this hilarious, romantic and unputdownable five-part series. As soon as I read Poppy Does Paris I knew I would love this series and I haven't been disappointed yet. Maggie, her boyfriend Leo and a bunch of his friends are off to a skiing group holiday in the French Alps. Maggie is full of excitement because it's New Years Eve and her first proper holiday since she and Leo became a couple over a year ago. Before the group went to Meribel Maggie hoped that this holiday will get her releationship to Leo back on track. His schedule has caused a lot of problems between them recently. Her feeling is growing that he's putting other people first and Maggie last. She wants to make things work but deep down she is not so sure about this. The one thing Maggie is worried about this holiday is that she is not a skier. Nonetheless she tries everything to cut a fine figure on the slope. This is were Maggie meets Sylvain, a gorgeous ski instructor, the line between harmless flirting and full-on misbehaviour becomes ... well, blurry. Will Maggie stay on the nursery slopes, or go seriously off-piste? 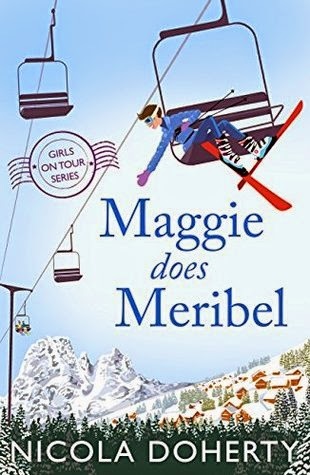 Maggie Does Meribel is great as the other parts in the Girls on Tour series. I feel like broken record to tell you that each novella is fantastic. For me, it has just gets better and better. This novella was a joy to read. What I really love about Nicolas novellas is that she always transports the atmosphere about the destination to me and makes me want to visit the place right away. Maggie Does Meribel is packed with excitement, a great cast of characters, a great location, plenty of laughter and a nice touch of romance. The perfect book to pick up on a wintery day with a cup of hot chocolate! I'm so ready for the next installemt in the series. I can't wait to read on which adventure Nicola takes me next with Rachel in Rome. Luckily I not have to wait anymore, Rachel does Rome is already out!